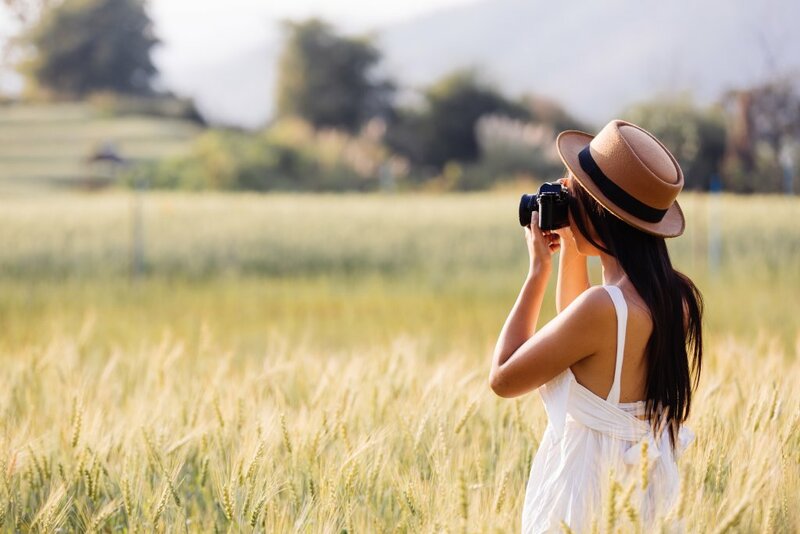 The 2019 hay fever season is now upon us, and many hay fever sufferers will be preparing for another spring and summer of streaming eyes, a blocked, runny nose and a scratchy throat. It’s a stressful and irritating time for so many people — when others can simply enjoy being outside in good weather with no symptoms at all. So we’ve put together this ultimate guide to the 2019 hay fever season, alongside King Edward VII’s Hospital consultant in Allergy and Respiratory Medicine, Dr Runa Ali. It will enable you to better predict and manage your symptoms. We’ve included a pollen calendar and tips from real life hay fever sufferers who took part in our hay fever focus group, so you can be prepared and be as free of hay fever symptoms as possible this year. Hay fever season starts early: your 2019 pollen forecast — check ahead! With the unseasonably warm weather we experienced in February this year, you may be like several of the unfortunate people in our focus group for whom the hay fever season has already begun. You may however have had some respite during the wet weather we had for most of March. Hay fever, also sometimes called seasonal allergic rhinitis, is a common condition caused by an allergic reaction to tree, grass and weed pollens. It’s usually worse during the spring and summer months, and according to the Met Office, it affects over a fifth of the UK population. It can affect anyone; male or female, young or old. Some sufferers have it all their lives, others may develop it later in life, or find that it comes and goes from year to year. Hay fever is triggered by an allergic reaction to pollen. This allergic reaction means that the body releases antibodies called Immunoglobulin E (IgE) to these ‘allergens’ (substances you’re allergic to). If you’re exposed to an allergen, your body mistakenly believes it to be harmful and releases IgE in response. This then triggers the release of a substance called histamine in the nose, throat and eyes. It’s this histamine which causes the typical symptoms of hay fever. We recently held a focus group to really get to the bottom of hay fever in the UK. We discovered the most common triggers, the best ways to ease symptoms and places to go on holiday to get the best relief during the summer months. Read on to discover real patient stories and how they may help you too. Hay fever will tend to stick around while the pollen you’re allergic to is in season. Why does my hay fever only affect me at certain times of the season? Hay fever is an allergic reaction to certain types of pollen. If you suffer with hay fever, it doesn’t necessarily mean that you’re allergic to pollen from all grasses, trees and weeds. It might mean that you’re only allergic to the pollen from one type of grass or tree, or to a few. The tree pollen season is from February to June and can cause very early hay fever symptoms. Grass pollen is usually in the air from May to July and is the most common allergen to cause hay fever. These months are the most common for hay fever sufferers to experience symptoms. The weed pollen season runs from June to September. This explains why your hay fever symptoms may occur at a different time of year to someone else’s. It also explains why, if you’re allergic to tree, grass and weed pollens, your symptoms are triggered for the entire hay fever season. The majority of our focus group said that they were allergic to grass pollen, which aligns with what UL charity Allergy UK says is the most common allergen for hay fever sufferers. What is pollen and why is it only around at certain times? Pollen is released by all plants as part of their normal reproductive cycle. It’s usually released by the male plant, from the stamen, and needs to reach the female plant in order to fertilise and produce seeds that grow into new plants. Usually a very fine powder, pollen is easily transferred by wind. Unfortunately, this also means that it can easily get into our noses, eyes and throats and cause havoc for hay fever sufferers. Most trees, grasses and weeds rely on wind pollination to reproduce. This means that they’ll release wafts of dry, dusty pollen into the air, in the hope that it’ll reach another plant of the same species in order to reproduce. Therefore, when we talk about tree, grass or weed pollen ‘seasons’. We mean that it’s during this time that these plants are reproducing. What about hay fever from flower pollen? Flowers tend to be bee (or other pollinating insect) pollinated plants. This means that they have brightly coloured, sweet smelling petals that attract bees, that then transfer flower pollen as they visit the next flower. This means that flower pollen doesn’t need to be as light and dusty as that of trees, grasses and weeds that are wind pollinated. Flower pollen tends to be larger, heavier and sticky. Flowers don’t need to send their pollen out on the wind, meaning that it therefore doesn’t hang around in the air. As a general rule, flower pollen doesn’t cause as much trouble for hay fever sufferers due to both its size and the fact it’s not carried by the wind. Good news for those who think they can’t enjoy cut flowers in their home! According to commercial florist, Jungle World, there are some flowers that are better suited to hay fever sufferers — these include pansies, carnations, orchids and primroses. Beware of lilies however, these were a common flower that triggered symptoms among our focus group. Why does the UK seem to trigger hay fever symptoms? Thankfully, you may find that your hay fever is only really bad for a few weeks a year. This is likely to be when a particular grass or tree is in its pollen season. One of the most common culprits is the London plane tree. 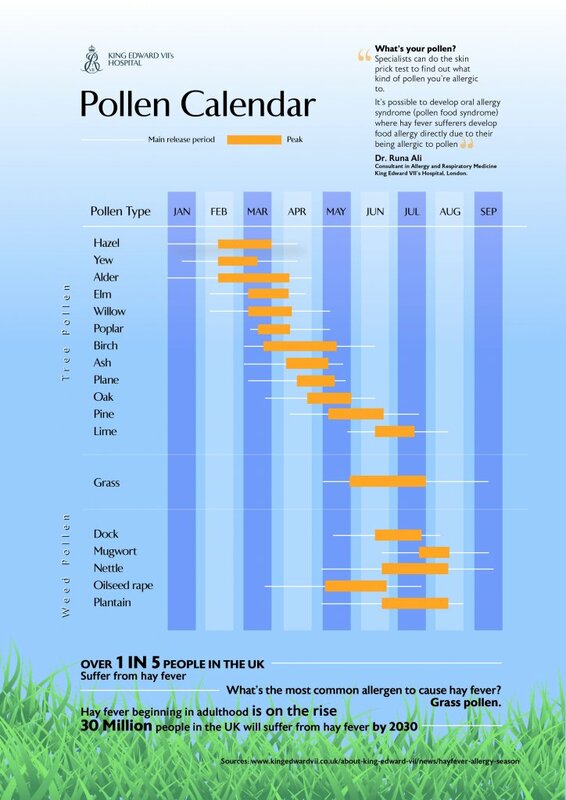 Planted on pavements and in parks in cities up and down the country (not just in London, despite its name) it’s responsible for hay fever symptoms during the early summer months. Oak, birch and ash trees are also popular in Britain’s green spaces and are commonly associated with hay fever symptoms. Britain’s green and pleasant lands aren’t always pleasant for everyone! Hay fever is most common in areas where there are more grassy, wooded areas. Even in cities around the UK, green spaces are still common, with their ubiquitous London plane trees. Plus, pollen can be carried great distances on the wind, and can arrive from green areas far away. If you’re looking to find relief from your symptoms, then a trip to the seaside could be the answer. Pollen counts tend to be lower in coastal areas due to the sea breezes carrying pollen away further inland. Going abroad can also provide respite from your symptoms. But only if the country you’re travelling to has different trees and grasses to those that you’re allergic to in the UK. Depending on the time of year that you go, it could mean that you avoid the worst of the pollen season that troubles you in the UK. Or it could mean that you arrive only to discover a grass or tree pollen that affects you even more! Two members of our focus group mentioned Jamaica as the place where their symptoms completely disappeared. Could the Caribbean be the answer to your hay fever, too? Flower power: is hay fever on the increase in the UK? The charity Allergy UK as reported in The Telegraph, says that cases of hay fever beginning in adulthood are on the rise. In fact, this rise is so great, they warn that in excess of 30 million people in the UK will suffer with hay fever by 2030. Researchers put this down to a few reasons. Pollen counts are on the rise and the UK is seeing many more days where the amount of pollen in the air exceeds previously seen limits. If you’ve only recently developed hay fever as an adult, it could mean that you weren’t sensitive to lower levels of pollen in previous years. There’s also concern that in big cities, pollution adds to the problem. Named ‘urban hay fever’, its thought that traffic fumes and other pollutants mix with pollen in the air and heighten the response of both within the body. Climate change also has an effect. As the planet heats up, leading to hotter, drier summers like that of 2018, more smog is formed. This smog is filled with exhaust fumes, nitrous oxide and ozone, that can make people more susceptible to pollen allergens. Evidence also exists that due to the ‘hygiene hypothesis’, we could become more likely to develop an allergy such as hay fever. This hypothesis works on the basis that exposure to bacteria and other bugs in childhood boosts our immunity which makes allergies less common. We now live in a much more careful and sterile world, so could this be making us develop more allergies? Some people also develop oral allergy syndrome, also called pollen food syndrome. This means that for sufferers, eating certain fruits, vegetables or nuts causes their mouth and throat to itch and sometimes swell. Oral allergy syndrome is caused by the body mistaking certain proteins within these foods for pollen. Cooking trigger foods helps to deactivate the allergic response. Most of the time, oral allergy syndrome causes mild symptoms, but in some people, symptoms can be more severe. Could my hay fever be something else? If you’re experiencing hay fever all year round, then you may be suffering with a condition called perennial allergic rhinitis instead. This causes the same symptoms and is still caused by an allergy, but instead of being triggered by pollen, it’s triggered by an allergy to something that’s usually inside in your home or work environment. Dust mites, pet hair and mould spores can all cause perennial allergic rhinitis. It’s also common to confuse hay fever with a summer cold. Hay fever causes similar symptoms in the nose and throat to a cold. One important difference, however, is how it affects your nose. If your runny nose is caused by a cold, it means it’s viral and your nasal discharge will be thicker and possibly even yellow or green in colour. A runny nose caused by hay fever isn’t bacterial or viral, and therefore means that your nasal discharge will appear thin, watery and colourless. Similarly, a cough caused by a cold or flu virus will usually become chesty and last for a couple of weeks. A cough caused by hay fever usually remains dry and tickly and can last for the whole of the pollen season. Asthma is a serious condition that can also be triggered by a pollen allergy. It causes shortness of breath where you might struggle to breathe, a tightness in the chest, coughing and wheezing or a rattling in the chest. If you think you have asthma, it’s important to seek medical attention straight away. The best way to find out what pollen you’re allergic to (aside from sitting outside all year round and working out which grass or trees are releasing their pollen and which ones trigger your symptoms) is to have an allergy test. There are two main ways your doctor will determine which pollen you’re allergic to. The most common is a skin prick test. This will involve your specialist allergy doctor drawing a grid on your arm and placing a drop of liquid into each square. Each liquid contains a different allergen. Your doctor will gently prick through the liquid into the top of the skin in each square, allowing the allergen access to your bloodstream. The allergens you’re allergic to will cause an itchy, red bump to appear within around 15 minutes. Those that you’re not allergic to won’t cause any reaction. You may then be able to avoid contact with these plants. Another way to determine your allergens is via a specific IgE blood test organised by your GP (if you don’t have a GP you can see one privately) or allergy specialist. There are things you can do yourself to help relieve the symptoms of hay fever. You may find some are useful, but others may be impractical (like staying indoors with the windows closed on a hot, sunny day or avoiding parks during the summer holidays with children that are off school). Try to adopt the tips here that are practical and fit into your life, to help minimise your symptoms. Check the weather forecast to monitor the pollen forecast, and if you can, try to plan outdoor trips when pollen is at its lowest level (usually in the early morning when the ground is still dewy and the air is cooler, and after rain). Avoid walking on freshly cut grass or in wooded areas. Stay indoors as much as possible when pollen counts are high and keep windows and doors closed. Keep your car windows closed when driving or travelling. Shower and wash your hair at the end of each day, removing your clothes as soon as you get home. Clothes can harbour pollen grains, so remove clothing away from your bedroom and wash items as often as possible. Don’t dry clothes outside as they’ll pick up more pollen. Keep your home as free from dust as possible and vacuum regularly. When you’re outside, wear wraparound sunglasses and put Vaseline inside each nostril to help prevent pollen grains travelling up and inside your nose. A steam bath may help to clear pollen grains from your nose. Pet hair also traps pollen grains, so consider whether you have a pet or not, that will want to come inside the home. Avoid introducing pollutants into your home, such as from smoking or burning smoky candles. Consider using an air purifier with a HEPA filter in your home and car. This can be really beneficial and mean that you can even open the windows! An air humidifier may also help. The allergic response to pollen leads to the release of histamines, hence the use of ‘antihistamines’ to help control the symptoms of hay fever. Antihistamine tablets, nasal sprays and eye drops can be bought over the counter from your local pharmacy. If these don’t work for you, and you’ve tried many different combinations, your GP may be able to prescribe different antihistamines but the best treatment to try next are drugs called corticosteroid nasal sprays. These medications are different to decongestants and can also be bought over the counter at any pharmacy and in large supermarkets or they can be prescribed by your GP. They reduce swelling and inflammation in the nasal passages and should be started at least two weeks before the hay fever season, as they take time to work. Corticosteroid nasal sprays should be used every day until the end of the pollen season, and not when needed. They are the single most effective treatment for all the symptoms of hay fever. If your hay fever severely affects your quality of life, despite trying all these medications, your GP can recommend a referral to an allergy specialist for consideration of a treatment called immunotherapy or desensitisation. This involves slowly exposing you to small amounts of different pollens, either under the tongue as self-administration or by injection in hospital, under medical supervision. It’s highly effective as it builds up your tolerance levels to each pollen and turns severe hay fever into a mild problem. However, changing the immune system takes time and the treatment is a three-year course. Interestingly, only two people in our focus group had prescribed medicine. The rest weren’t aware that they could get prescription medicines for hay fever and simply accepted their symptoms as a way of life. This doesn’t have to be the case, so make sure you chat to your GP if you’re suffering in silence. Keep an eye on the pollen forecast to help predict and manage your hay fever symptoms. We wish you a relatively sneeze-free summer!